"Paris massacre" redirects here. For other incidents, including the Charlie Hebdo attack and the November 2015 attacks, see Paris attacks (disambiguation). 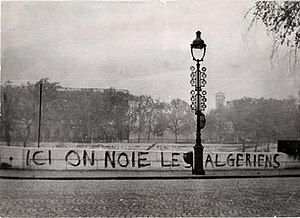 Tagged on the Pont Saint-Michel in 1961: "Ici on noie les Algériens" ("Here we drown Algerians"). Dozens of bodies were later pulled from the River Seine. The Paris massacre of 1961 occurred on 17 October 1961, during the Algerian War (1954–62). Under orders from the head of the Parisian police, Maurice Papon, the French National Police attacked a demonstration of some 30,000 pro-National Liberation Front (FLN) Algerians. After 37 years of denial and censorship of the press, in 1998 the French government finally acknowledged 40 deaths, although there are estimates of 100 to 300 victims. Death was due to heavy-handed beating by the police, as well as massive drownings, as police officers threw demonstrators in the river Seine. The massacre appears to have been intentional, as has been demonstrated by historian Jean-Luc Einaudi [fr], who won a trial against Maurice Papon in 1999. (Papon had been convicted in 1998 on charges of crimes against humanity for his role under the Vichy collaborationist regime during World War II.) Official documentation and accounts of eyewitnesses within the Paris police department suggest that the 1961 massacre was directed by Papon himself. Police records show that Papon called for officers in one station to be "subversive" in quelling the demonstrations, and assured them protection from prosecution if they participated. Forty years after the massacre, on 17 October 2001, Bertrand Delanoë, the Socialist Mayor of Paris, put up a plaque in remembrance of the massacre on the Pont Saint-Michel. How many demonstrators were killed is still unclear. In the absence of official estimates, the placard which commemorates the massacre stated: "In memory of the many Algerians killed during the bloody repression of the peaceful demonstration of 17 October 1961". On 18 February 2007 (the day after Papon's death) calls were made for a Paris Métro station under construction in Gennevilliers to be named "17 Octobre 1961" in commemoration of the massacre. The events were documented by a number of photographs, many of them graphic. On 17 October 1961, the massacre took place in the context of the Algerian War (1954–62), which had become increasingly violent over the years. After de Gaulle's equivocal return to power during the May 1958 crisis and his sudden change of policy concerning Algerian independence, the OAS used all possible means to oppose the National Liberation Front (FLN), which took the war to the metropolis where it was helped by some activists such as the Jeanson network. The repression by French authorities, both in Algeria and in metropolitan France, was very harsh. According to historian Jean-Luc Einaudi, a specialist on the massacre, some of the causes of the violent repression of the 17 October 1961 demonstration can best be understood in terms of the composition of the French police force itself, which still included many former members of the force in place during the World War II Vichy regime which had collaborated with the Gestapo to detain Jews, as for example in the Vel' d'Hiv Roundup of 16–17 July 1942. The vast majority of police officers suspended after the Liberation of Paris in 1944 for extreme forms of collaborationism (including assistance to the Parti Populaire Français and similar groups) were later reintegrated into the police forces. In contrast, some of the policemen who had been part of the Resistance movement had their career advancement blocked because of Cold War anti-communism, since the Resistance was partially communist and communist ministers had been expelled from the government in May 1947. Moreover, police officers who had been members of the Resistance might well have taken part in the various raids against Jews and other persecuted groups during the Vichy regime, as otherwise they would have been dismissed, according to Einaudi and Maurice Rajsfus. The career of Maurice Papon as Head of Paris' police force in the 1960s and Minister of Finance under Valéry Giscard d'Estaing's presidency in the 1970s, suggests that there was institutional racism in the French police until at least the 1960s. In fact, Papon was not charged and convicted until 1997–98 for his World War II crimes against humanity in being responsible for the deportation of 1,560 Jews, including children and the elderly, between 1942 and 1944. Before his appointment as chief of the Paris police, Papon had been, since 1956, prefect of the Constantine department in Algeria, where he actively participated in the repression of and the use of torture against the civilian population. On 13 March 1958, 7,000 policemen demonstrated in the courtyard of the police headquarters, against the delays in the "risque prime" accorded to them because of the war, although the FLN had not yet begun to target police officers at this time. Encouraged by far-right deputy Jean-Marie Le Pen, 2,000 of them attempted to enter the Palais Bourbon, seat of the National Assembly, with shouts of "Sales Juifs! A la Seine! Mort aux fellaghas!" (Dirty Jews! Into the Seine (river)! Death to the (Algerian) rebels!). With the recommendation of Minister of Interior Maurice Bourgès-Maunoury, Maurice Papon was next day named prefect of the police. Two years earlier, in Constantine, Algeria, he had assumed the role of "Inspecteur général pour l'administration en mission extraordinaire" (IGAME – General Inspector for the Administration on Extraordinary Mission). "Prohibited zones, detention centers ('camps de regroupements'), torture, executions without trial: this is the reality of the war he [Papon] was supervising out there." According to Einaudi, in the following years he applied these methods in Paris and the Seine department. After the May 1958 crisis and the installation of the new Fifth Republic under 'Free France' leader Charles de Gaulle's leadership, Maurice Papon was kept on. Papon created the 'compagnies de district' (district companies), police forces that specialized in repression, where new police recruits were trained. These district companies were formed mainly from veterans of the Indochina War (1947–54) and young Frenchmen coming back from Algeria. In the past two days, a racist concentration camp has been opened in Paris. They have not even had the good sense to choose a site which would not remind French patriots who are currently celebrating the anniversary of the Liberation of Paris of what took place there. According to Einaudi, "Already at this time, policemen [were] boasting about throwing Algerians in the Seine" river. Vincennes' "identification center" (CIV – Centre d'identification de Vincennes) was then created under the authority of the prefecture of police in January 1959. Algerians detained during police raids in the Paris region could be brought there for identity verifications but could also be put under house arrest by the police prefect. "These raids were frequently the occasion of violence," Einaudi stated. The Auxiliary Police Force (FPA – Force de police auxiliaire) was then created in 1959. This special constabulary force, put under the authority of the Algerian Affairs Coordination Center of the Prefecture of Police (Centre de coordination des Affaires algériennes de la préfecture de police) and supervised by the military, was under the control of Papon. Led by Captain Raymond Montaner and based at the Fort de Noisy, Romainville, it was composed entirely of Algerian Muslims – recruited either in Algeria or in France. In autumn 1960, the FPA was composed of 600 members. It first operated in the 13th Arrondissement where it requisitioned café-hotels. Torture is rumoured to have been utilized most notably at 9, rue Harvey and 208, rue du Château des Rentiers. Forced disappearances took place. The FPA then extended its action to the 18th Arrondissement, where three hotels were requisitioned in rue de la Goutte-d'Or. The FPA was also active in the suburbs, from the summer of 1961, in particular in Nanterre's bidonvilles. Some voices were opposed to these crimes denied by the police prefecture". Christian magazine Témoignage Chrétien wrote: "It is not possible to stay mute when, in our Paris, men are resurrecting the methods of the Gestapo". The FLN decided to resume bombings against the French police at the end of August 1961; from the end of August 1961 to the beginning of October 1961, 11 policemen were killed and 17 injured in Paris and its suburbs. "These bombings had the effect of spreading fear throughout the ranks of the Paris police, but also for increasing the desire for revenge and hate against the whole of the community. During the whole of September, the Algerian population was severely repressed. In practice, this massive repression was based on physical appearance", according to Einaudi. Daily raids against Algerians — frequently confusing any Magreb people (Moroccans or Tunisians), and even Spanish or Italian immigrants, with Algerians. – Algerians were arrested at work or in the streets and were thrown into the Seine with their hands tied in order to drown them, among the other methods used for this repression, as shown for example by a report published by the priest, Joseph Kerlan, from the Mission de France. According to historian Einaudi, "It was in this climate that, on 2 October, during the funerals of a policeman killed by the FLN, the police prefect (Papon) proclaimed, in the prefecture's courtyard: "For one hit taken we shall give back ten!" This call was an encouragement to kill Algerians and was immediately understood as such. On the same day, visiting Montrouge's police station, the prefect of police declared to the police officers present: "You also must be subversive in the war that sets you against others. You will be covered, I give you my word on that." On 5 October 1961, the Prefecture of Police announced in a press statement the introduction of a curfew from 8.30 p.m. to 5.30 a.m. in Paris and its suburbs for "Algerian Muslim workers", "French Muslims" and "French Muslims of Algeria" (all three terms used by Papon, although the approximately 150,000 Algerians living at the time in Paris were officially considered French and possessed a French identity card). The French Federation of the FLN thus called upon the whole of the Algerian population in Paris, men, women and children, to demonstrate against the curfew, widely regarded as a racist administrative measure, on 17 October 1961. According to historian Jean-Luc Einaudi, Papon had 7,000 policemen, 1,400 CRS and gendarmes mobiles (riot police) to block this demonstration, to which the Prefecture of Police had not given its agreement (mandatory for legal demonstrations). The police forces thus blocked all access to the capital, metro stations, train stations, Paris' Portes, etc. Of a population of about 150,000 Algerians living in Paris, 30,000–40,000 of them managed to join the demonstration however. Police raids were carried out all over the city. 11,000 persons were arrested, and transported by RATP bus to the Parc des Expositions and other internment centers used under Vichy. Those detained included not only Algerians, but also Moroccans and Tunisians immigrants, who were then sent to the various police stations, to the courtyard of the police prefecture, the Palais des Sports of Porte de Versailles (15th Arrondissement), and the Stade Pierre de Coubertin, etc. Despite these raids, 4,000 to 5,000 people succeeded in demonstrating peacefully on the Grands Boulevards from République to Opéra, without incident. Blocked at Opéra by police forces, the demonstrators backtracked. Reaching the Rex cinema (the site as the present Le Rex Club on the "Grands Boulevards"), the police opened fire on the crowd and charged, leading to several deaths. On the Neuilly bridge (separating Paris from the suburbs), the police detachments and FPA members also shot at the crowd, killing some. Algerians were thrown into and drowned in the Seine at points across the city and its suburbs, most notably at the Pont Saint-Michel in the center of Paris and near the Prefecture of Police, very close to Notre Dame de Paris. During the night, a massacre took place in the courtyard of the police headquarters, killing tens of victims. In the Palais des Sports, then in the "Palais des Expositions of Porte de Versailles", detained Algerians, many by now already injured, [became] systematic victims of a 'welcoming committee'. In these places, considerable violence took place and prisoners were tortured. Men would be dying there until the end of the week. Similar scenes took place in the Coubertin stadium... The raids, violence and drownings would be continued over the following days. For several weeks, unidentified corpses were discovered along the banks of the river. The result of the massacre may be estimated to at least 200 dead. In 1961, the police prefecture spoke only of "2 persons shot dead". Following historian Jean-Luc Einaudi's testimony during the Papon trial in the late-1990s, left-wing police Minister Jean-Pierre Chevènement ordered the opening of parts of the archives. The resulting Mandelken Report, based on the investigation of these partial records, counted 32 dead. Einaudi then published an op-ed in Le Monde on 20 May 1998, contesting this official figure, criticizing both the methodology of the report and the consulted records. He called attention to the fact that many of the records had been destroyed. A report that Papon had prepared for Interior Minister Roger Frey, the prime minister, and the head of government, Charles de Gaulle, was not included in the consulted records. In addition, the Mandelken report ignored the massacre that had taken place in the courtyard of the Police prefecture, and Papon's name itself appeared nowhere in the report. Einaudi concluded his op-ed stating that: "on the night of 17 October 1961 there had been a massacre perpetrated by the police forces acting on the orders of Maurice Papon." Papon subsequently filed a lawsuit in February 1999, a courtsuit against him, because of this sentence, alleging defamation of a public servant. In the meanwhile, the state acknowledged in 1998 the massacre and spoke of 40 dead. Responding to Papon's request, the court gave an ambiguous judgement. It stated that Einaudi had "defamed" Papon, but that Einaudi had acted on "good faith", and praised the "seriousness and quality" of Einaudi's research. Both Papon and Einaudi were thus vindicated by the court's judgement. The French government commission in 1998 claimed only 48 people died. Historian Jean-Luc Einaudi (La Bataille de Paris, Paris: Seuil, 1991) asserted that as many as 200 Algerians had been killed. The historian Jean-Paul Brunet found satisfactory evidence for the murder of 31 Algerians, while suggesting that a number of up to 50 actual victims was credible. This contradicts David Assouline, who in 1997 was granted limited access to consult part of the police documents (which were supposed to be classified until 2012) by Minister of Culture Catherine Trautmann (PS). He found a list of 70 persons killed, while the texts confirmed Einaudi's comments that the magistrates who had been called on by the victims' families to consider these incidents had systematically acquitted the policemen. According to Le Monde in 1997, which quoted the director of the Paris Archives, the register listed 90 persons by the second half of October. In a 2001 article in Esprit, Paul Thibaud discussed the controversy between Jean-Luc Einaudi, who spoke of 200 killed on 17 October, and 325 killed by the police during the autumn of 1961, and Jean-Paul Brunet, who gave an estimate of only 50 (and 160 dead, possible homicide victims, who passed through the IML medico-legal institute during the four months between September and December 1961). Although criticizing Einaudi on some points, Thibaud also underlined that Brunet had consulted only police archives and took the registers of the IML medico-legal institute at face value. Based on other sources, Thibaud pointed out (as did Brunet) that administrative dissimulation about the dead had taken place, and that the IML could not be relied upon as sole source. Thibaud concluded that Einaudi's work made it possible to give an estimate of 300 Algerian victims of murder (whether by police or others) between 1 September and 31 December 1961. The events surrounding the massacre and its death toll were largely unknown for decades. There was almost no media coverage at the time. These events remained unknown in part because they were overshadowed in the French media by the Charonne Metro Station massacre on 8 February 1962 whose victims were not only Algerians, but also French members of the French Communist Party. On 26 October 1961, Georges Montaron, editor of Témoignage Chrétien, Claude Bourdet, editor of France Observateur, Emmanuel d'Astier de la Vigerie, editor of Libération, Avril, editor of Télérama, parish priest Lochard, Jean-Marie Domenach, editor of Esprit magazine, Jean Schaeffert and André Souquière organized in the Maison de la Mutualité a meeting to "protest against police violence and the repression of the 17 October 1961 demonstration in Paris". On 17 October you won... the victory against Algerian terrorism... Your moral interests have been successfully defended, since the aim of the police prefecture's opponents to put in place an investigation committee have been defeated. On 8 February 1962, another demonstration against the OAS, which had been prohibited by the state, was repressed at Charonne metro station (Affaire de la station de métro Charonne). Nine members of the CGT trade union, most of them French Communist Party members, were killed by the police forces, directed by Maurice Papon under the same government, with Roger Frey as Minister of Interior, Michel Debré as Prime Minister and Charles de Gaulle as president, who did all they could to "dissimulate the scale of the 17 October crime" (Jean-Luc Einaudi). The funerals on 13 February 1962 of the nine persons killed (among them, Fanny Dewerpe) were attended by hundreds of thousands of people. On 8 February 2007 the Place du 8 Février 1962, a square near the metro station, was dedicated by Bertrand Delanoë, the mayor of Paris, after sprays of flowers were deposited at the foot of a commemorative plaque installed inside the metro station where the killings occurred. According to James J. Napoli, coverage of the massacre by major British and American media sources, such as The Times, TIME magazine and The New York Times, downplayed the severity of the massacre as well as the Paris government's responsibility for the events. The official death toll was initially three, before the French government acknowledged in 1998 that the massacre occurred and that a vague "several dozen" people were killed. No one has been prosecuted for participation in the killings, because they fell under the general amnesty for crimes committed during the Algerian War. This included on one side French police and military personnel fighting for France; and on the other side various French-ethnic (pro-independence, often communist) and Algerian fighters, for attacks on civilian targets such as cafés, which killed 3,000 civilians. if a step forward had been taken with the decision of the city of Paris to put a commemorative plaque on the Pont Saint-Michel, [he] deplored that the text which was chosen for it invokes neither the idea of a crime against humanity nor the responsibility of the author of the crime, the state. Thus, in no case does this Parisian initiative exempt the highest national authorities from taking responsibility. In addition, if [former Socialist Prime minister] Lionel Jospin personally expressed himself last year [in 2000] by speaking of "tragic events", neither the police's responsibility in the crime nor that of those politically responsible at the time have been clearly established, much less officially condemned. On 17 October 2012, President François Hollande acknowledged the 1961 massacre of Algerians in Paris. A memorial plaque for Algerians killed on 17 October 1961 by Parisian police officers who were acting under orders of the Prefect of Police, Maurice Papon. The massacre was referenced in Caché, a 2005 film by Michael Haneke. The 2005 French television drama-documentary Nuit noire, 17 octobre 1961 explores in detail the events of the massacre. It follows the lives of several people and also shows some of the divisions within the Paris police, with some openly arguing for more violence while others tried to uphold the rule of law. Drowning by Bullets, a television documentary in the British Secret History series, first shown on 13 July 1992. The massacre is the subject of Leïla Sebbar's 1999 novel The Seine was Red: Paris, October 1961 (La Seine était rouge (Paris, octobre 1961)). The massacre is described in the opening verse of Irish punk rock band Stiff Little Fingers song 'When The Stars Fall From The Sky'. French rapper Médine dedicates a whole song to the massacre on his album Table d'écoute. African-American novelist William Gardner Smith put the figure at "over two hundred" in his 1963 novel, The Stone Face. It is a mark of the success surrounding the official blackout of information about October 17 that Smith's novel, written by a foreigner in France and published in the United States (it could not be published in France), would stand as one of the few representations of the event available all the way up until the early 1990s–until the moment, that is, when a generation of young Beurs, as the children of North African immigrants call themselves, had reached an age at which they could begin to demand information about their parents' fate. Professional or academic historians have lagged well behind amateurs in the attempt to discover what occurred on October 17; investigative journalists, militants, and fiction writers like Smith, or the much more widely read detective novelist, Didier Daeninckx, kept a trace of the event alive during the thirty years when it had entered a "black hole" of memory. In 2013, Rachid Ouramdane [fr] produced a work during which Dorothée Munyaneza read out the names of victims of the massacre. In 2017, French comedian Jhon Rachid created a short film about the massacre, entitled Jour de Pluie (Rainy Day). ^ a b "Le 17 octobre 1961, la réalité d'un massacre face à un mensonge d'Etat (17 October 1961, the reality of a massacre against a state lie)" (in French). Le Monde. 16 October 2001. Retrieved 7 May 2006. ^ "Une station de métro " 17 Octobre 1961 " ?" (in French). Archived from the original on 11 December 2007. Retrieved 9 December 2007. ^ a b c See Jean-Luc Einaudi and Maurice Rajsfus, 2001, pp.73–74 for 25 August 1958 FLN offensive; the detention of 5,000 Algerians; L'Humanité quote and the "boasting about throwing Algerians in the Seine". ^ Report quoted by Einaudi, pp.76–79. ^ "17 octobre 1961 : la longue liste de morts des archives de Paris" (in French). L'Humanité. 23 October 1997. ^ Concerning David Assouline's access to part of the Paris' Archives and the Monde quoting the director, see "17 octobre 1961 : la longue liste de morts des archives de Paris". L'Humanité. 23 October 1997. ^ Quoted by Einaudi, pp.83–84. ^ Quoted by Einaudi, p.85. ^ "Charonne, passé au scalpel de l'historien (interview with historian Alain Dewerpe, member of the Ecole des hautes études en sciences sociales)". L'Humanité. 6 February 2006. ^ "Charonne et le 17 octobre enfin réunis". L'Humanité. 11 February 2006. ^ "The Washington Report on the Middle East: The 1961 Massacre of Algerians in Paris: When the media failed the test". ^ Ramdani, Nabila (16 October 2011). "The massacre that Paris denied". London: The Guardian. Retrieved 20 November 2015. ^ Degoy, Lucien (17 October 2001). "17 OCTOBRE 1961 Olivier La Cour-Grandmaison: le silence n'est plus de mise". L'Humanité. Archived from the original on 27 September 2003. ^ Hani, Tahar (18 October 2012). "Le 17 octobre 1961, 'ce jour qui n'ébranla pas Paris'" (in French). France 24. ^ a b Ross, Kristin (2002). May '68 And Its Afterlives. Chicago, IL & London: The University of Chicago Press. p. 44. ISBN 978-0-226-72799-8. ^ Beauvallet, Ève (19 January 2015). "DOROTHÉE MUNYANEZA, UNE DANSEUSE DE HAUT VOLT". Libération (in French). Retrieved 6 December 2018. Daniel A. Gordon (2000). "World Reactions to the 1961 Paris Pogrom". University of Sussex Journal of Contemporary History. 1: http://www.sussex.ac.uk/history/documents/2._gordon_world_reactions_to_the_1961_paris_pogrom.pdf. Jean-Paul Brunet, « Police Violence in Paris, October 1961 : Historical Sources, Methods and Conclusions ", The Historical Journal, 51, 1 (2008), p. 195–204. Jim House, Neil MacMaster, « Time to move on : a reply to Jean-Paul Brunet ", The Historical Journal, 51, 1 (2008), p. 205–214. Jean-Paul Brunet, Police Contre FLN: Le drame d'octobre 1961, Paris: Flammarion, 1999, 354 p.
Jean-Paul Brunet, Charonne. Lumières sur une tragédie, Paris: Flammarion, 2003, 336 p.
Alain Dewerpe, Charonne, 8 février 1962. Anthropologie historique d'un massacre d'Etat, Gallimard, 2006, 870p. Olivier LeCour Grandmaison, Le 17 octobre 1961 – Un crime d'État à Paris, collectif, Éditions La Dispute, 2001. Sylvie Thénault, " Le fantasme du secret d'État autour du 17 octobre 1961 ", Matériaux pour l'histoire de notre temps, n°58, April–June 2000, p. 70–76. Wikimedia Commons has media related to Paris massacre of 1961. Amanda Morrow (2 December 2010). "1961 – Algerians massacred on Paris streets". Radio France Internationale. “Vacarme” Interview with historian Alain Dewerpe on his book Charonne, 8 février 1962. Anthropologie historique d'un massacre d'Etat, available on the website of the French intellectual review . A list of the dead or missing. “17 octobre 1961: Retour sur les lieux” A 14' video about the 1961 massacre, by French historian Mathilde Larrère [fr] (Arrêt sur images media platform) (created 17 Oct 2017). This page was last edited on 21 April 2019, at 22:48 (UTC).